Emanuele Torquati will close the year 2018 with 2 important engagements. First will be on 4th December in Slovenia, at Biennale Koper, presenting a chamber music program with violinist Helena Winkelman and cellist Francesco Dillon, ranging from Schumann to Sciarrino, including two recent works by Stefano Pierini and Helena Winkelman. 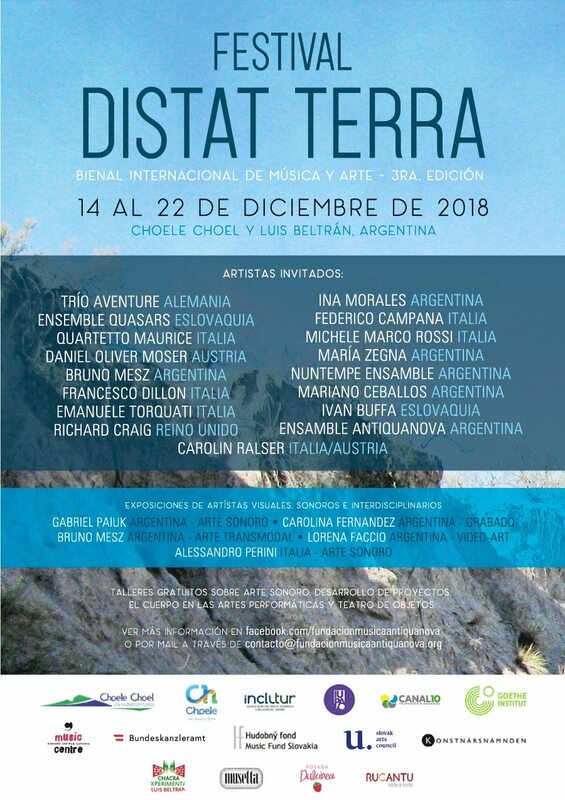 Second will be from 17th till 21st December in Argentina, for the prestigious Academy of Distat Terra Festival in Patagonia, where he will give a Piano Masterclass and a Solo Recital on 20th. Program will feature Claude Debussy luminous Suite Bergamasque, as well as important works from contemporary composers, French Colin Roche, Argentinian Master Mariano Etkin and last but not least the virtuosic Mambo written by Luca Francesconi. On 21st December will join cellist Francesco Dillon for the Final Concert of the Festival, with a chamber music program featuring Italian New Music, from Scelsi till Silvia Borzelli, and Debussy seminal Sonata in g minor.